The name of the corporation, hereinafter referred to as the “Association” is Valley Forge Watershed Association (VFWA) located at 42 East Indian Lane , Norristown , PA 19403 . The period of duration of the Association is perpetual. The Association is organized exclusively for charitable purposes, including for such purposes, the making of distributions to organizations that qualify as exempt organizations under section 501 (c) (3) of the Internal Revenue Code, or corresponding section of any future federal tax code. The Association may receive and administer funds for charitable purposes, within the meaning of Section 501 (c) (3) of the Internal Revenue Code and to that end, the Association is empowered to hold any property, or any undivided interest therein, without limitation as to amount or value; to dispose of any such property and to invest, reinvest, or deal with the principal or the income in such manner as, in the judgment of the directors, will best promote the purposes of the Corporation, without limitation, except such limitations, if any, as may be contained in the instrument under which such property is received, these Articles of Incorporation, the Bylaws of the Association, or any applicable laws, to do any other act or thing incidental to or connected with the foregoing purposes or in advancement thereof, but not for the pecuniary profit or financial gain of its directors or officers except as permitted under the not-for-Profit Corporation Law. No part of the net earnings of the Association shall inure to the benefit of any member, trustee, officer of the Corporation, or any private individual, except that reasonable compensation may be paid for services rendered to or for the Association affecting one or more of its purposes, and no member, trustee, officer of the Association, or any private individual shall be entitled to share in the distribution of any of the corporate assets on dissolution of the Association. No substantial part of the activities of the Association shall be the carrying on of propaganda, or otherwise attempting, to influence legislation, and the Association shall not participate in or intervene in, including the publication or distribution of statements, any political campaign on behalf of any candidate for public office. Upon the dissolution of the Association or the winding up of its affairs, the assets of the Association shall be distributed exclusively to one or more charitable, religious, scientific, testing of public safety, literary, or education organizations which would then qualify under the provision of Section 501 (c) (3) of the Internal Revenue Code and its Regulations as they now exist or as they may be hereafter amended, or to the federal government, or to a state or local government, for a public purpose. Any such assets not so disposed of shall be disposed of by the Court of Common Pleas of the county in which the principal office of the Association is then located, exclusively for such purposes or to such organization or organizations as said Court shall determine, which are organized and operated exclusively for such purposes. The qualification for members and the manner of their admissions shall be regulated by the Bylaws. (Copy of Bylaws attached). Initial street address in the state of Pennsylvania of the initial registered office of the Association is 42 East Indian Lane , Norristown , PA 19403 , and the name of the initial registered agent at such address is Curt Huston. The territory in which the operations of the Association are principally to be conducted is the United States of America and its territories and possessions. 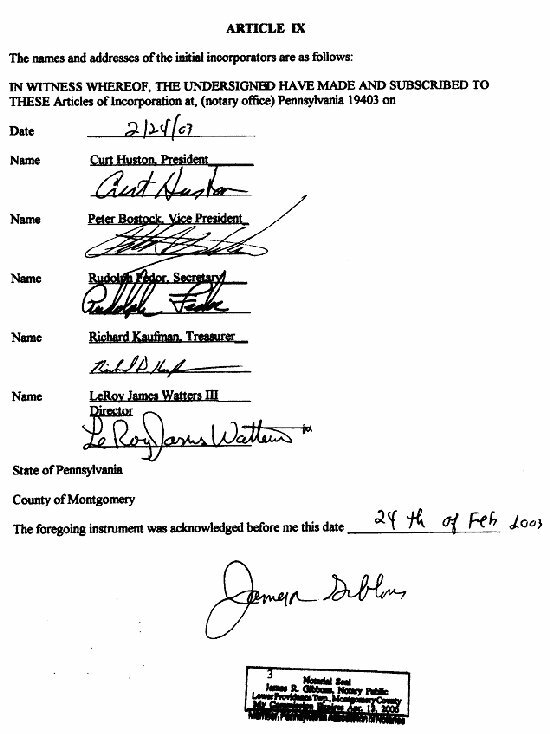 The initial board of directors shall consist of at least four (4) members, who need not be residents of the state of Pennsylvania .